Every part of your garden serves a different function. Try classic copper lights for gateways and entrances. If you’re keen on having a dependable light source throughout your garden, then underground-wire lights are a fantastic option. Pergolas and general seating areas are better suited to having discreet lights dimmed and hidden behind foliage to provide a relaxing atmosphere. Candle sets are a perfect low-key mood and come in a multitude of varieties: sitting on the tabletop, hanging between the trees in ceramic holders or even floating in your outdoor water features. Driveways, on the other hand, are well suited to recessed LED lighting and bollard lights – as are dark paths and wooden decking areas. LED spotlights are cheaper than halogen bulbs and last longer. 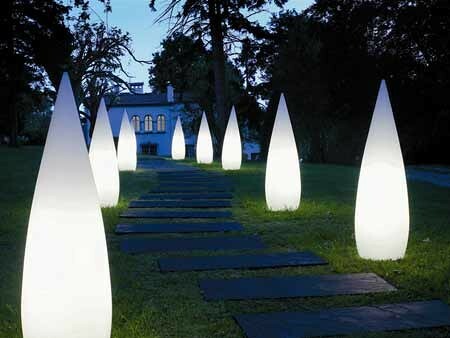 They’re subtle enough to light up your paths without creating the appearance of an airport runway. The minimalist in you might like to utilize interesting lighting effects with simple spotlights. An outdoor pool can be instantly lit with the glimmering result of mirror lighting: illuminate a far-off object like a tree or sculpture, and the light will reflect it back on the water’s surface. But what if the ornament in your garden is what you want to highlight? Try using shadow lighting by throwing light onto an object close to a wall, creating a dramatic silhouette – or cross lighting your feature with two spotlights on either side. If you are more inclined to romantic extravagance or are keen on finding that perfect ornamental light to complement your garden, think lamps, lanterns and fairy lights. Moroccan-style lanterns are a personal favourite of mine as their delicate grandeur and vivid glass can instantly add colour and charm to a garden, and you can never have too many. Whether you like tiki torches, classic country-style designs or a rustic paper lantern style, the options are endless to add that perfect decorative touch. Use pulsing net lights to gently illuminate shrubbery and small trees, or multi-coloured fairy lights for a festive atmosphere. The last thing to consider is how to manage all your different forms of garden lighting in a cost-effective way. Solar powered lights are a popular alternative option to traditional electric lights as they are ecofriendly and provide no extra electricity costs. They also require no extra underground wiring, so are simple to install and remove. Lighting helps bring a horticultural landscape to life by highlighting its best features. Whether you employ artistic lamps and lanterns or prefer the minimalistic look, consider our suggestions in helping you create your perfect garden. 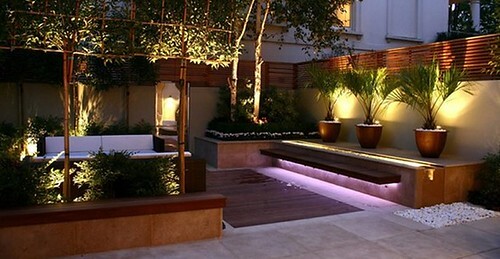 Do you have any further garden lighting ideas? Share in the comments below. Joey works in the visual arts and enjoys decorating the interior and exterior of her Sims 2 houses and writes for Webbs Direct.